Every year I look forward to the summer months. Everyone is happy in warm weather - it's the season of eating al fresco and relaxing outside... The reality, of course, is that everyone takes advantage of the weather to organise every fair, fete, show and sporting fixture known to man! My normally busy life becomes totally frantic and sometimes things don't go according to plan. Well that's when this kind of card comes in handy! I love the colour combination of So Saffron and Not Quite Navy. Here, one of the stamps from the Punches Three hostess set was coloured with a Not Quite Navy marker, omitting the sentiment, and stamped onto Whisper White card stock. 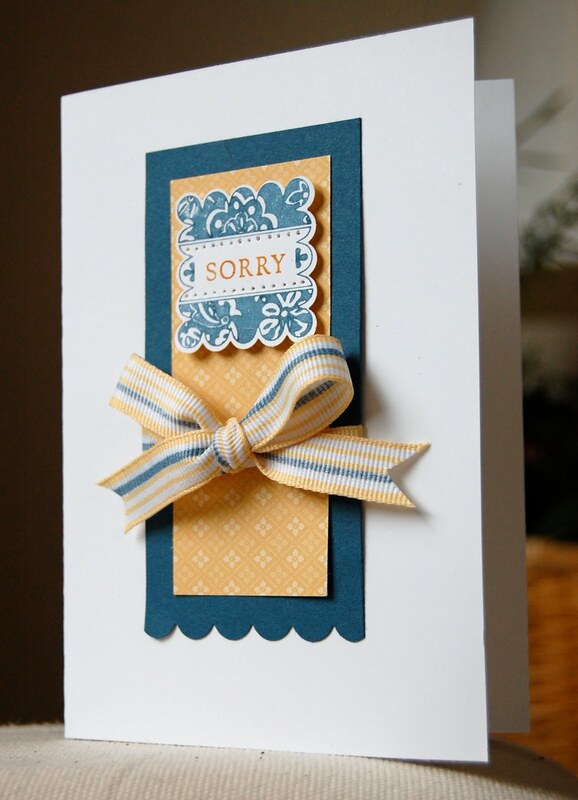 I added the Sorry using my stamp-a-majig for placement and then cut the whole thing out with the scallop square punch which fits perfectly. It was mounted with a dimensional onto a piece of So Saffron designer series paper and then onto a piece of Not Quite Navy card stock that I'd scalloped at the bottom with the scallop border punch. I wanted a piece of ribbon to bring the two colours together, so I used a trick that my upline Michelle taught me - using a ruler and drawing a line with my Not Quite Navy marker straight onto my So Saffron striped grosgrain ribbon. Love this trick! Punches Three has to be one of my favourite hostess sets because of its versatility - I love the shaped tags you can make with it, I love that the scallop square punch makes quick work of cutting them out and I love that you can use any sentiment with the stamps. Hostess sets, for those that don't know, are not for sale but are given free to those that host stamping parties, depending on orders. If you're planning on booking a party with me, try to catch me in June or July as you could earn £45 worth of free goodies during these months! Click here for more details. I'll be back tomorrow with some gift ideas. Gorgeous colours, and love the bow. Lovely card, great colours and I love the trick with the ribbon. p.s. yes I feel for Rob Greene, pity the rest of the team didn`t turn up!! ABSOLUTELY love it! Love the colour combo/layout/nifty and clever way you did the sentiment and the ribbon! All round - a great job- in my faves! Fab card, those colours work so well together. I love the colours to Vicky. Brillant!